Looking for a simple yet striking long earring to compliment your updo or short hair style? These these fit the bill perfectly. As mysterious as they are gorgeous, these lovely antiqued gold chain earrings are loaded with swing and sparkle. Fiery crystals ignite the deep backdrop of antique brass. Sparkly greens with splashes of purple play off the soft pink crystals above and then anchored by the rich topaz crystal at the top of these stunning earrings. The crystals of these earrings have been cut by hand by the manufacturer to capture and reflect more light. Each of the crystals resides on its own section and connected the next crystal providing tones of motion. Lovely, thin antiqued brass chains playfully dance beneath the diamond cut crystal above. 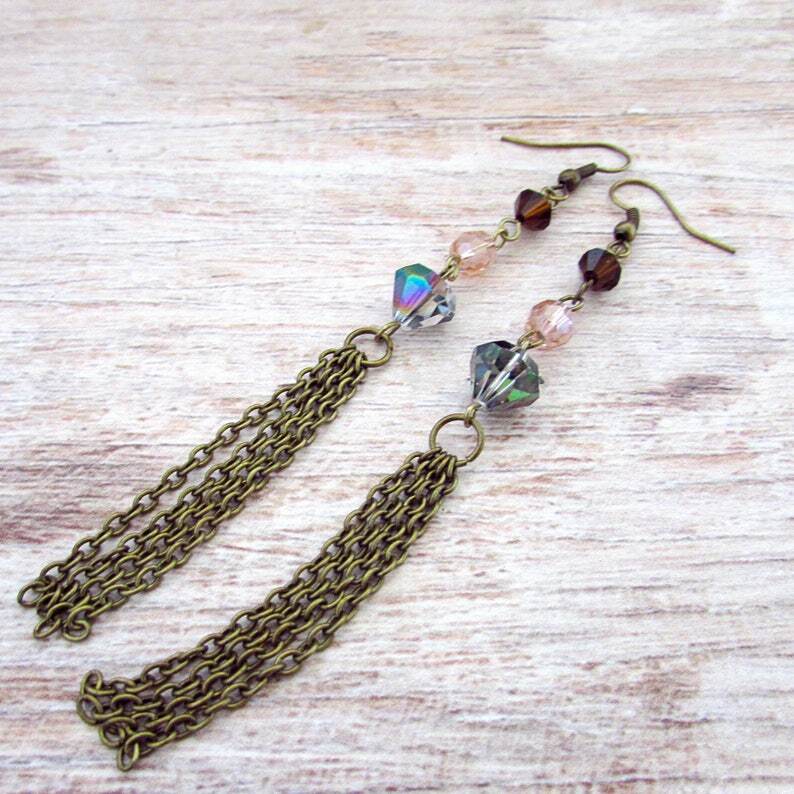 These ear wires of these earrings are Nickel and lead free antiqued brass French hook style. These earrings measure approximately 4.25 inches (10.8 cm) in total length. Thank you for choosing The Feathered Elephant for all of your Bohemian jewelry needs. Photos are shot at close range in natural light using the MACROS setting. Detailing and sizes may be amplified from what is normally seen with the eye. Beautiful! Exactly what I wanted - true to photos. Thank you for the beautiful cuff! Item was packaged very nicely, arrived quickly and was as described. I am pleased with my purchase. For all copper & brass jewelry, simply wipe your items off with a soft dry cloth & store in a box or zipper storage bag. Inserting a piece of chalk into your bag or box will help to prevent tarnish as well. Never spray cologne directly on copper/brass jewelry as this will cause the protective seal to break down & lead to tarnish. Do not apply lotions or creams while wearing your jewelry as this will lead to tarnish. Do not sunbath or swim while wearing copper/brass or any plated jewelry. If pronounced tarnish & patina develop, soak in acetone to remove any remaining sealer. Then clean with a brass/copper polish. Patina is a natural process for brass & copper. It is in no way a flaw or defect in the metal. Custom and personalized orders are always welcome; however, NO refunds or exchanges are accepted on these items as they are customized to your specific color and style. If purchasing a ready-made piece listed in our shop that you wish to change, a $10 redesign fee will be added to cover labor and materials. Why does it take so long for ear cuffs to be shipped? Ear cuffs take extra time due to these items are not mass-produced by an outside company. Each ear cuff is created when an order is placed. They are cut, filed and formed by hand to ensure the highest quality for our customers. Copper and brass ear cuffs a bit take longer as they have to be sealed to prevent tarnish and patina. Adding a few extra days to the shipping time allows for the sealant to properly cure before being packaged and shipped. How are your ready-to-ship items stored before shipping? All of our finished jewelry pieces as well as our components are in our private studio and kept away from smoke and pets. This in mind, pet hair does travel on our clothes unaware. So, please take care if you are allergic to cats. How will my items ship? Your lovely new jewelry pieces will be shipped in a cardboard jewelry gift box with padding inside the box. All earrings and ear cuffs will be on a card and wrapped in cellophane. Necklaces are usually wrapped with care in colored tissue paper and placed into a cardboard jewelry gift box. More simplistic necklaces will arrive on a card and wrapped in cellophane and tissue paper within a cardboard gift box. All orders are shipped in padded mailers and/or a mailing box. Can I return or exhange the jewelry in your shop? ONLY IF THE ITEMS ARE UNWORN AND IN THEIR ORIGINAL CONDITION. This is due to hygiene issues. We offer our customers first-quality, NEW jewelry merchandise. Not worn jewelry items. Earrings and ear cuffs CANNOT be returned due to the same hygiene issue. We consider these items as "intimate" items. By placing an order with us, you understand and agree that you have read the listing, taken note of all materials used and finished sizes of items, understand what comes with the item listing you purchased and have read the age recommendations. Furthermore, by placing an order with us you agree that you have read and understood our shop policies, terms and conditions and that you agree to be bound by our terms and conditions stated when you complete your purchase from us at checkout. IN NO EVENT SHALL THE FEATHERED ELEPHANT, THEFEATHERDELEPHANT.ETSY.COM, THEFEATHEREDELEPHANT.COM OR ANY OF ITS AFFILIATED ENTITIES OR SUPPLIERS BE LIABLE FOR ANY INDIRECT, SPECIAL, PUNITIVE, INCIDENTAL, EXEMPLARY OR CONSEQUENTIAL DAMAGES AND/OR INJURIES, EVEN IF THE FEATHERED ELEPHANT, THEFEATHERDELEPHANT.ETSY.COM, THEFEATHEREDELEPHANT.COM HAVE BEEN PREVIOUSLY ADVISED OF THE POSSIBILITY OF SUCH DAMAGES AND/OR INJURIES, WHETHER IN AN ACTION, UNDER CONTRACT, NEGLIGENCE OR ANY OTHER THEORY, ARISING OUT OF OR IN CONNECTION WITH THE USE, INABILITY TO USE OR PERFORMANCE OF THE INFORMATION, SERVICES, PRODUCTS & MATERIALS AVAILABLE FROM THE SITE. The Feathered Elephant only collects mailing addresses for the sole purpose of shipping and nothing else. We do not keep a file of your credit card info; however, Etsy does retain your credit card/banking information. We have no control over that aspect of the Etsy site. Please refer to Etsy's privacy policies for more information.